Designed to meet UL, VDE, IEC and CSA. Dual bobbin construction for low interwinding capacitance. 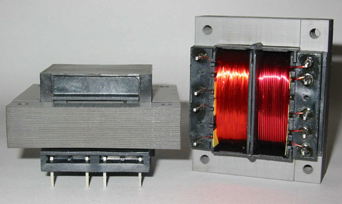 Eliminates need for electro-static shielding and provides 4000V Hipot. 130 degree C insulation system. Exceeds UL flammability requirement. Dual 115V/230V primaries are standard. DC Output combinations +-12V and 5V on +-15V and 5V. Rated at regulation output.